Tag Archives: Harvest Moon on the next Make No Bones About It. Harvest Moon is a Quinault Ambassador, historian, basket weaver and storyteller whose name means “A light shining forth in the midst of darkness”. She has been telling stories over half her lifetime, ones that will make you laugh, cry and will move you. She speaks from her heart and spirit, leaving people looking at a different perspective of the Northwest Coast Native Americans. 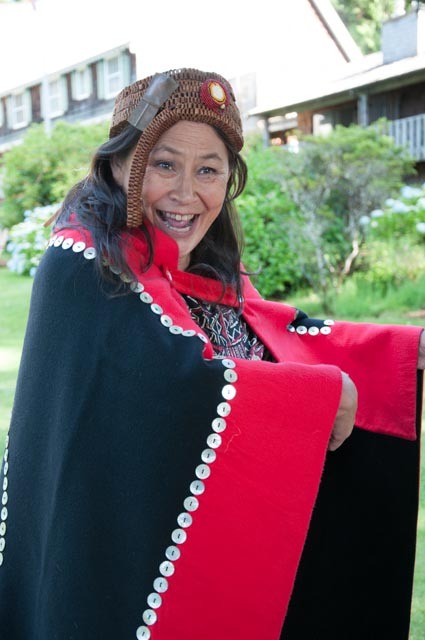 She has received the “Peace and Friendship Award”, from the Washington State Historical Society in recognition of significant contributions to the understanding of N.W. Indian Heritage and has served two terms for “The Washington Commission for the Humanities.” In addition, Harvest Moon has received grants from the Seattle Arts Commission, Bainbridge Island Arts and Humanities and Heritage Arts Council for “Artist in Residency” through out Washington Schools.